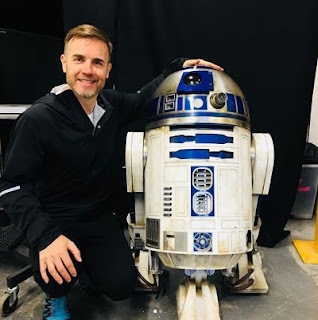 Home / -News- / Gary Barlow / Take That / Gary Barlow Had a Cameo in "Star Wars: The Last Jedi"
Gary Barlow Had a Cameo in "Star Wars: The Last Jedi"
Singer Gary Barlow made his cameo appearance as a resistance soldier in Star Wars: The Last Jedi. The Take That frontman revealed earlier this year that he had landed a small part in the latest sci-fi installment but he wouldn't be playing a storm-trooper, leading many to wonder where he would appear in the film. The location of his cameo has now been confirmed by Gareth Edwards, who directed spin-off Rogue One: A Star Wars Story, as he also scored an appearance in the same scene. During an interview with www.fanthatracks.com, Gareth described filming a trench scene on the mineral planet of Crait at Pinewood Studios near London alongside the singer. "I got there and obviously they probably briefed everyone but I got there late, so they were like, 'Stand there, put this on', and I went into this trench and I had no idea what was going on, and I looked to my right and it's Gary Barlow," Gareth recalled, before hinting that there were other stars in the trench too by referencing reality TV show I'm a Celebrity... Get Me Out of Here! "I think his wife or girlfriend (wife Dawn) was there as well. You start looking down the line, it was a bit like, 'I'm a rebel, get me out of here,'" he continued. Gary told U.K. TV show Lorraine in March that he had a part, and explained, "I think the Star Wars people are so strict about what information (is out there). So, me saying that, I've probably just done myself out of a role." After the film was released earlier in December, he shared pictures of himself posing inside the Millennium Falcon and with droid RD-D2 on Instagram. In the caption, he wrote, "These pictures were all taken in 2017 on the set. They won't release any pictures you've had taken until the film is released. This is how they do it in another Galaxy far far away." It is thought Princes William and Harry had cameos as stormtroopers but director Rian Johnson has refused to confirm the rumours. Justin Theroux, Lily Cole, Ellie Goulding, Edgar Wright also had cameos, while Tom Hardy's didn't make the final cut.